A fellow food lover from another continent reached out to me a few weeks ago, wondering if I'd be interested in meeting up while he's in town. It's not my usual practice to meet up with complete strangers, but as we seem to have a couple of mutual friends, I kinda said to myself... "why the hell not?!" As I found out tonight, I actually completely ignored an earlier request to meet up... some 5 years ago! After some discussion, we decided to meet up at The Chairman (大班樓). As there were only two of us, it would have been tough to do dinner at most Chinese restaurants. I remembered that this place has a set menu designed for two, so here we are. Szechuan spicy New Zealand crispy lamb belly (川味香辣紐西蘭小羊腩) - served with slices of cucumber, pickled mustard (榨菜), spring onions, chili and Szechuan peppercorns. Good amount of acidity here to balance out the fat. I was a little surprised that the chef decided to lead off with this... While the original intention may have been to stimulate our taste buds with the first course, the chili lit my tastebuds on fire, while the Szechuan peppercorns simultaneously numbed my tongue. Yes, the lamb was fatty and crispy the way I like it, but wouldn't this have been better towards the end?! Deep fried crab meat and mushrooms dumplings (酥炸蟹肉香菇盒) - deep-fried is always good... The crispy shell is softened by the sauce that one ladles on top. The filling consists of crab meat, diced spring onions, and a tiny bit of mushrooms. Pretty fragrant in the mouth. Steamed fresh flowery crab with aged ShaoXing Wine and fragrant chicken oil and flat rice noodle (雞油花雕蒸大花蟹配陳村粉) - I suggested that we pay the supplement for this option because, after all, THIS is the signature dish of the restaurant. Before the dish showed up, I was wondering if they would really serve us a whole flower crab, but they did! Besides the delicious crab, the story of this dish lies in the sauce made with aged Huadiao wine and chicken fat. Very fragrant and with a tinge of bitterness on the finish, I eagerly ladled an increasing amount of it over the rice noodles. If there was one perennial wish, it would be for the chef to add more chicken fat in the sauce... the way it was done at my beloved Manor Seafood Restaurant (富瑤海鮮酒家). But maybe my visitor was right... the chef did it this way was out of concern for our health. Braised spare ribs with dark soya sauce, Chinese wine and red yeast (三杯紅麴一字排骨) - I opted for this choice instead of the "old" version that is braised spare ribs with preserved plums in caramelized black vinegar (話梅肉桂糖醋排骨). Look at the fat here! Honestly I can't remember this much fat from my previous visits tasting the other version of spare ribs, but I ain't complainin'! I love how tender and tasty the ribs become with braising, but I didn't get the distinctive flavors that I typically associate with dishes that are cooked with "three cups (三杯)". I also didn't taste any of the red yeast. Chinese vegetables stir fried with ginger (薑汁芥藍) - nice and crunchy stems on the kailan. Fried rice with prawns trio – fresh prawns, sun-dried prawns and shrimp paste (三蝦炒飯：鮮蝦, 蝦乾, 蝦膏) - since my last visit I've come to terms with the fact that this type of fried rice should be done dry. The flavors here were dominated by the shrimp paste, while the textures provided by diced fresh prawns, diced dried prawns, and diced kailan. Fresh ground almond cream (生磨杏仁茶) - my visitor was surprised by the presence of almond in a Chinese meal, but I assured him that almond cream is a pretty classic Cantonese dessert. Wolfberry ice cream (杞子雪糕) - I've never been a fan of this ice cream, since the wolfberries have too little flavors and the milk in the ice cream is overpowering. 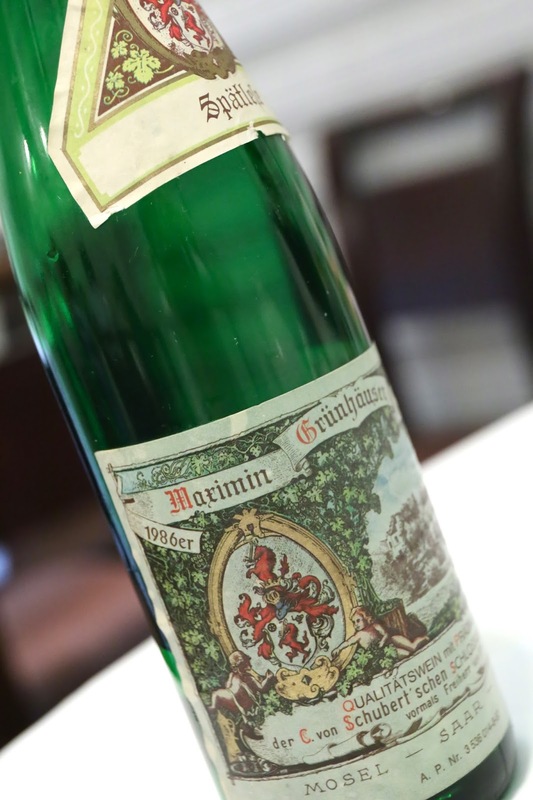 1986 Von Schubert Maximin Grünhauser Abstberg Riesling Spätlese - lovely and fragrant nose of white flowers, coupled with classic notes of plastic. Still tasting pretty young and vibrant, with nice acidity that is not quite crisp thanks to some softness due to aging. Slightly bitter on the back palate. This turned out to be a little too much food for the two of us... and we didn't even finish the rice noodles that came with the crab... nor the big bowl of flied lice. I'm glad I got a chance to make a new friend, and had the chance to go through the tasting menu for two at The Chairman. I can see that the restaurant is making an effort to cater to visitors who may not have the ability to call upon a large group for a "proper" Chinese meal, and this may explain this place's popularity with a certain crowd... as well as its ranking on Asia's 50 Best Restaurants.